Arbez Investments, known for their unrivalled quality accommodation services, have confidently announced their arrival in Masvingo by opening a state-of-the-art guest house to provide quality bed and breakfast services for executives. Situated in Rhus Avenue in the leafy Rhodene suburb, The Stallion Guest House is set to up the game in overnight accommodation as well as function and conference services in the city. The official launch of The Stallion Guest House on Saturday May 20, 2017 was graced by members of the business and tourism communities. Speaking at the launch, Alex Mushonhiwa, who is the director of Arbez Investments, said their services were mainly targeted at executives, Non-Governmental Organizations (NGOs) personnel coming to Masvingo as well as families who seek a comfortable night away from home. "We started in 2014 in Chiredzi where we have now expanded to 13 rooms, and our guests suggested that we introduce a similar service in Masvingo," Mushonhiwa said. "Despite the tourism sector in the southern region being slow, our aim is to eventually grow into tour operations in order to serve our clients coming to the southern region," Mushonhiwa said. Speaking at the same event, City of Masvingo Deputy Mayor James Chiwara said The Stallion Guest House brings quality accommodation services which are needed by the city in its drive to attract visitors and investment. "We appreciate this kind of development brought about by Arbez Investments. We initially had an argument as council over the location of the guest house but we were impressed that the company followed proper licensing channels. "Let us encourage each other when it comes to business ideas like this one so that we improve our tourism sector,"Chiwara said. 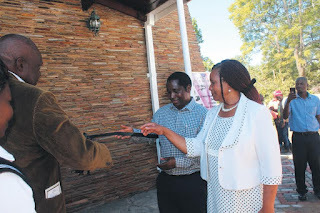 The Stallion Guest House Masvingo branch manager Veronica Masaga said the organisation was open to ideas and suggestions which will help them improve their services. Informative post! I have learn a lot of information. Thanks for sharing with us. If you want to know about best Guest Houses in Harare, this post can provides information about guest houses. The garden is somehow the favorite place to hang out with friends and families. Somehow, it needs a good renovation to make it even more appealing to your guest's eyes.